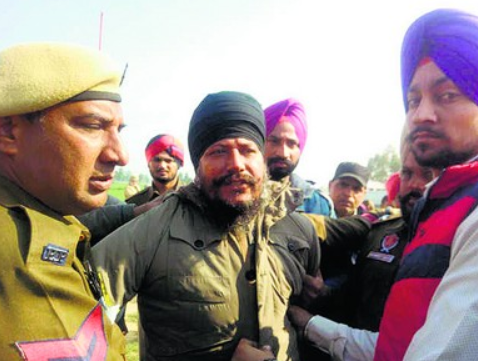 Gurbachan Singh Ajnala, a Sikh man who hurled a shoe at Parkash Badal in 2017 in protest of the beadbi incidents in Punjab, was given a two year sentence by a civil judge at the Malot Court. Ironically, his target, Parkash Badal and some key police officials were found guilty by Justice Ranjit Singh’s Commission Report of having direct involvement in the killing of two Sikh youth at Behbal Kalan in 2015, and the various cases of desecration that occurred at that time in Punjab. None of the officials named in the report have been arrested or charged, yet Gurbachan Singh has been given a two year sentence for merely hurling a shoe in protest of the sacrilege incidents. In January of 2017, Parkash Badal, who was at that time the Chief Minister of Punjab was addressing a rally at the village of Ratta Khera in Lambi when Gurbachan Singh hurled a shoe at him. The shoe reportedly first hit a security guard and then the Chief Minister’s face and knocked off his glasses during his speech. No one was hurt in this incident. According to the Police Gurbachan Singh was upset over the sacrilege incidents which took place in Punjab when he hurled his shoe, which is considered a insult in many eastern cultures, as the senior Badal. Gurbachan Singh is the younger brother of Amrik Singh Ajnala, a leader of a Damdami Taksal faction, based in Ajnala.